← Is Health Care a Democratic Right? The recent demotion of Bear’s Ears and the Grand Staircase-Escalante as national monuments pose risk of a deepening widespread and almost inevitable alienation from public lands. The tenuous status of public lands was apparent in the mandate of protection after intense lobbying of the American Petroleum Institute and other players in the energy industry to cut the limits of National Monuments across the United States, in ways that stand to redefined American West. And even as our so-called President touts his relation to the common people, apart from the political class, the proprietary relation to public lands that he seeks to instill by removing protected lands of national monuments like Bears Ears stands sadly at odds with the longstanding image of the identification with the legends of the white man in the open space of the American west’s sun-drenched outdoors, whose landscape was open to the grit of white, male conquest of an empty space–although the decision to remove Bears Ears from the list of protected lands suggests an abandonment of that image of the heroic cowboy, replaced by the disillusioned world-weary post-industrialist capitalist character we seem to have as American President. For Trump has definitively moved away from that imaginary, and the image of the open frontier, or of this land is your land, this land is my land, into a vision where the very same land is now poised to be opened to mineral extraction and prospecting, reducing the area once identified with the West to an area defined by the priority of industrial claims, and transforming it to a terrain inviting the colonization by extractive industries. With his pursed lips, and evasive eyes, turning his back on a monumental landscape of the West, President Trump appears oblivious the destruction of space to occur across the national monuments opened to prospective mining, extraction of resources, and mineral industries, as if to deny their history, and allow the big rigs of extractive industries to enter to repossess those areas they have claimed on the map. The preservation of a national monument that would rejoin fragmentary Indian Lands, indeed, was the strategic scope of the declaration of the two regions as part of our protected national heritage, in an attentive to remove previously protected lands from mineral prospecting in southern Utah, with the aim to improving the local economy and attract investment to the state now represented by Mike Lee and Orrin Hatch, who have both advocated the proposal to open the region to prospectors, with far less concern for its future of the country–responding to heavy lobbying by uranium mining company Energy Fuels Resources, which provoked a widely criticized Interior Department review, Trump issued executive orders that shrunk the monument to newly reduced boundaries. For Hatch, eagerly labeling the designation of the national monuments as “unjustified federal land grabs,” evoking the increasingly militant anti-federal lands movement, particularly strong in Utah, who act as if the government had hidden interests in staking claims to a territories form wildlife refuges, conservation areas, national parks, or national monuments, summons a misguided anti-government credo as a basis for ending public lands. In replacing a sense of “goods” for the nation worthy of protection by the federal government–the purpose of the Antiquities Act of 1906, which expanded executive ability to conserve areas for preservation of their historical or scientific interest–to a vision of the executive asfacilitating abilities for exploitation of national space, and ensuring energy extraction. The result is to threaten fragile material evidence of the region’s prehistoric inhabitation in a site recently put off-limits to oil and gas exploration on account of its use value to extractive industries, contesting the inherent value of preserving an area that has been considered among the most “endangered” historical sites in America. The rewriting of what constitutes a national monument is quite a sense of a sharp change in history, marked by an inevitable separation of the landscape from the past. The shift of Bears Ears from a site worthy of conservation,seems definitively erased as the revelation of the minerals, oil, and gas that lie beneath the ground within the earlier boundaries of the former National Monument. The possibilities of extraction had been mapped in surveys of the mineral resources of the region, which focus not on the delicate nature of its environment; the map of minerals ignores sacred remains lying on the surface in its boundaries, and foreground them, rather than the delicate ecosystem of animals and pure water. Indeed, its pollution would irreparably compromise the region, and replace the reasons cited for its historical and cultural value to its exchange value. Are we in danger of mipmapping not only our national patrimony, but future? It is almost as if Trump is following a new map, provided by the extractive industries with which he has thrown in his lot. And in place of preserving individual sites of antiquity, this map shifts from the above-the-ground complex ecosystem and archeological ruins previously cited as warranting protection for future generations and for the nation: what was a “good” for the nation is in the course of being redefined, as the underground “goods” able to be extracted displace those lying on the surface of a bioregion of southeastern Utah currently in danger of being compromised–even as the newest national monument in the intermountain desert protected by Bears Ears Inter-Tribal Coalition largely in recognition of widespread evidence of its historic inhabitation. While Trump argues at his own tribal rallies, exultantly insisting “we’re into [clean air and water” also, folks–but you don’t have to turn off all business!” even as the EPA rolls back clean air and water rules, the absence of attention to environmental preservation in the national monument is striking and mind boggling, if not a relinquishing of duty. By revoking the region’s status as a national monument, and reducing the protected area to almost 80 percent of the current Bears Ears National Monument and the Grand-Staircase Escalante National Monument by 45 percent, Trump has divided Bears Ears into two smaller regions, to allow access to the red, mineral-rich areas, in particular, following on the recommendations of his Interior Secretary drastically to shift the status of a considerable range of national monuments that would include the historic mesas. The new geography of the national monument suggests a vision that is stubbornly and insistently reduced to mineral resources, flattening the historical value of the region and replacing any sense of its place by mapping it at a dangerous remove, and foregrounding the value of its industrial resources above its landscape. Walter Benjamin’s Angel of History could not see the destruction of the open spaces of lands until after they have occurred, of course, at which point they lie at the feet of the Angelus Novus, who is propelled forward in time, seeing only the wreckage at his feet; but the rewriting of the material relation to the land–and the symbolic relation to the land–constitute a broad remapping of the place of the west and western lands within our minds. If labor was the exploitation of nature for Benjamin, the exploitation of nature rests both on material labor, but the remapping of the landscape we once saw as part of historical memory as a nation to a material resource, destined to be opened to a growing energy market, and be converted into petroleum and gas. Trump has, in short, turned his back on any romantic concept of the open spaces of the west, with some uncertainty, as he seems to take a step into an unknown future of open access to energy resources mapped as lying under these once hallowed grounds, which stand to become transformed into an industrialized landscape, and changed beyond recognition, without a sense of what we have lost. We are in danger of losing any sense of the picture on the ground. The map of resources seems to compromise the map of the land by local inhabitants, or indeed the picture of the region on the ground of a lived landscape, filled with rich traces, and freshwater streams, that has long held status as a sacred site in our national imaginary as a frontier. The accelerated arrival of an entirely new relation to the land, as extractive industries that has been used to demote Bears Ears from a nationoal monument stands to transform open spaces that were once identified with the mythos of the nation. The resulting removal of all regulations that the reduction of national monuments would mean fails to understand the monument as an ecosystem of environmental integrity, and indeed the historical value of the lands as sites: it is almost as if the difficulty of defining the value in a society which uses GPS to map locations on a UTM projection to locate mineral deposits and sites of potential petroleum drilling–and erases the holistic image of a vanishing landscape that has long been so central a part of our national patrimony. For by reducing the land set aside in the National Monument to questions of cash flow, the administration seems to have decided to use a map to abstract the Bears Ears area to the value of resources hidden beneath its historic landscape. –the division of the national monument into two rumps opens many of the areas where mining claims were staked, and allows further claims to be made, as well as encourages easy transport of extracted materials from the historic grounds, by denying their claims to historical value. Indeed, by reopening many of the BLM claims on the region, the decision to parse Bears Ears from a continuous monument seems a give-away to extractive industries. The gains of that lobby in asserting their claims and rights to access mineral deposits and veins stands to emerge as one of the largest land grabs in American history, reshaping the notion of the protection of public lands and access allowed to drilling, pipelines, and mines on federal lands, as if definitively abandoning any concept of the value in their preservation for posterity. Indeed, only by recasting the role of government as securing lands worthy of protection as a case of undue restraint on business can the dire effects of the plans for expanding private leases on public lands be failed to be recognized as a shifting the preservation of historical legacies to permit widespread industrial leases on federal lands in ways that abandon and relinquish a clear long-term view of their value. When Interior Secretary Ryan Zinke questioned whether a third of Interior employees were “loyal to the flag” before the National Petroleum Council, a petroleum industry group–and desired to reduce the “physical footprint” of the Interior Department by reducing the civil service employees who he sees as obstacles to opening up the permitting process for oil-drilling, logging, uranium mining, and energy development he sees as President Trump as having a legal mandate to accelerate, Zinke seems to make an end-run around the public custody or preservation of increasingly fragile lands of sacred resonance to many of the residents who most prize its integrity. Indeed, the agressively regressive attacks that the Trump administration has made on environmental regulations or responsible custodianship of public lands–leading states to file suit against the Environmental Protection Agency and EPA administrator Scott Pruitt for rolling back agency policies of designating areas of dangerously high ground-level ozone in unprecedented ways–is mirrored in the attack on protecting public lands, on which the Interior Secretary seems to have no endgame save leasing them to industry. The agressiveness with which Zinke has taken aim at the government’s custodial role over wilderness and public lands–some of the few places where undisturbed ecologies exist–suggest a widespread attack on the notion of wilderness. Is it possible that the Trump administration is preparing to excavate any federal mandate to protect historic lands, as well as to allow the expansion of extraction across previously protected lands? When Interior Secretary Zinke complains “I can’t change the culture without changing the structure,” he suggests a broad disbanding of regulations accumulated over time with local groups after consideration of public impact that he wants to cast as obstructionists and arbitrary bureaucrats. Yet when Zinke suggested that “Fracking is proof that God’s got a good sense of humor and he loves us,” he conjures a terrifying hybridization of manifest destiny and unrestrained corporate greed. Zinke’s initial review of a full twenty-one National Monuments on federal land stand to change the landscape of the American west. For in removing acreage of interest to private industry from federal protection, in a particularly short-sighted move under the quixotic banner of energy independence, the Trump administration seems bent on allowing the very federal lands protected by government for posterity to be treated as lots able to be leased for private development, without appreciation of their historical, cultural, or sacred value. The map of National Monuments under “review” suggest a euphemism analogous to downsizing, and a shift in the conception of the custody of national lands–including the Grand Canyon–that seems to prepare for the excavation of what were the most protected federal lands. The expansion of national monuments currently designated “under review”–which has led to the recent declaration shrinking Bears Ears and renaming two protected areas that constitute but a rump of the once National Monument he Obama administration named after substantive negotiation with local stake-holders, reveal the dangerously unconsidered course by which protected public lands stand to be declassified in order to meet the demands of private industries, many of whom have already mapped mineral deposits or previously leased mines in their ground. Zinke tweeted images of how he rode to his first day as Secretary on Interior on a horse named Tonto, sporting a ten gallon hat, flanked by the US Park Police, in a coded gesture to fulfill the demands of farmers and outdoorsmen: the self-designated cowboy of Trump’s cabinet was on his way to eliminate protected status of federal lands, ready to remap most delicate open areas for extractive industries and the environmentally toxic mining and drilling of fossil fuels, in the name of energy independence: if intended to evoke Theodore Roosevelt’s commitment to the outdoors, the dark garb and black hat suggested apt funereal garb to preside over the dismemberment of the American West. But the usurpation of an identity as a cowboy outdoorsman in which Zinke has cultivated seems an apt metaphor, if unintentional, for the disenfranchisement of native inhabitants of a land that has been hold sacred for generations, and is a priceless repository for cultural artifacts and prehistoric ruins, as well as a priceless fossil record of dinosaur bones. Zinc’s cultivation of the image of a cowboy outdoorsman who loves western open lands exemplifies a dangerous sort of double-dealing. For his policies he adopts run rampant over protection of the most fragile federal lands. And despite presenting a public face of affection for the outdoors concealing the agenda of energy industries to shift the landscape of the American West, the re-dimensioning of public lands and National Monuments opens them to coal industries and petroleum and uranium mining. The redrawing of Bears Ears is isolated, but foretells a terrible vision of the curtailment of federal lands by future leasing, drilling, and mining–at the same time as curtailing access to parks by substantially raising their entrance fees nationwide. Nowhere are the fears of opening lands to drilling more feared than in the Alaska’s Wildlife Refuge. Yet under the quixotic directive of ensuring “American energy dominance” the koan of the Trump administration, and the meaningless slogan “Energy Is Good,” the charge to remove regulations on coal, drilling, and oil pipelines are cast as a means to confirm our prosperity and energy independence as a nation, in deeply misguided ways that are based only on doublespeak, but epitomized by the withdrawal of any sense of custody for the increased scarcity of undisturbed open lands, or an obligation to future Americans. The policy of leasing public lands is perhaps the nastiest and self-serving updating of Manifest Destiny and its promise of ever-open west. For it denies the immense contraction of public open lands in the past twenty years, and is based on a dangerously outdated image of unlimited geographical resources in an outdated image of American progress that conceals the coming dark clouds of toxic pollution unleashed across the landscape by extractive processes, trading as they do in an outdated image promising the unbound expansion of civilization across open lands, in John Last’s iconic allegory of American Progress of Columbia stringing the prairies with telegraph wiring. The belief linking progress to annexation and expansions was long seen as in contest with democratic ideals, but belief in a national right of annexation as “extending the area of freedom” has expanded to include the despoilment of public lands, without considering consequences of inviting industrial advance, as if we have failed to map such consequences with needed clarity. The proposed reduction of two National Monuments in Utah–Bears Ears and the Grand Staircase-Escalante–may be the start of a broad process of privatizing a landscape long central in the national imaginary, whose management is increasingly up for review: the central role energy firms hold in the reevaluation of National Monuments’ as protected demands to be mapped, in order to illustrate the dangers of recasting public lands as fungible properties able to be leased for profit as private real estate as their value rises, and indeed boundaries of protected lands “revised” in the light of mineral deposits and needed access to them: the premium place on a “push to energy independence” conceals a massive remapping of the American West, both redrawing the boundaries of monuments of historical and cultural legacy and renaming wildlife areas like “ANWR,” creating a plot of leased tracts that omit words like “wildlife” and “refuge” bears, and allow new standards of the valuation of property in the name of securing greater “access to energy,“ “energy independence” and “the global competitiveness of our country,” without any sense of the limited scale of lands under federal protection, and the relative ease of their rapid pollution and destruction. The haphazard redrawing of their boundaries follows no other rationale than to allow access to sites of mining and transport of minerals–including radioactive uranium–through the former monument, by lifting all protections from the region save in the two remaining vestiges of Bears Ears. For in reducing protected lands of Bears Ears National Monument by 1.15 million acres, Donald Trump has preserved but 15% of its former expanse, and opened other regions to leasing. “I am a geologist,” Secretary Zinke has boasted, as if these were credentials o expand the National Petroleum Reserve into the adjoining Arctic National Wildlife Refuge, and not only to ascertain the presence of fossil fuel deposits. While Zinke’s actions of aggressive leasing may seem a scheme to reduce the budget deficit–leasing just 2,000 acres of the Wilderness Refuge could generate an easy billion in national revenue–his fake declaration of expertise conceals his defense of established lobbying interests of the petroleum and mining industries, and of libertarian outdoorsmen who openly attack federal agencies. By reframing land management in terms of the monetary fungibility of public lands, and promising billions from leasing them could bring, the cowboy in Trump’s cabinet seems to have promoted newspeak terms like “untapped resources” to conceal long-term consequences of their loss, much as the distorted scale of assertions of opening “about one ten-thousandth of the ANWR” to oil leases conceals the huge pollution leasing to energy industry would quickly generate. The monuments were among the last areas of the United States to have been mapped, but their remapping in radically reduced form less than a sixth of their current expanse seems to fetishize only the buttes of the delicate federal lands–as if they were a backdrop for the sort of photo-shoot Zinke has posed for GQ magazine, rather than an ecosystem. In choosing to turn attention from the protection of the delicate ecosystem of the region, Zinke seems to propose a remapping of federal lands and recent National Monuments by privileging underground mineral resources that lie beneath them. For the presence of lands able to leased for mineral deposits and fossil fuels motivated the redrawing of their boundaries to curtail protected status by five sixths, reducing their extent to expand possibilities for mineralogical prospecting. Bears Ears were effectively remapped by the GPS determination of mineral deposits–coal; uranium; zirconium; oil–but the landscape whose survival leaves it a pristine wilderness, filled with historical and cultural ruins as well as paleontological remains; it has been remapped by companies who privileged access to these deposits above the value of the ruins that densely crowd the region: rendering this region accessible to vehicular traffic will disrupt its sacred, cultural and paleontological ruins as well as the landscape of canyons and mesa that lie below the imposing buttes–and lift protections against the introduction into the region of pipelines, mines, drilling for oil wells, or public roads. The result is not only unprecedented as an executive decision of land management, but as a precedent for altering policies of the custom and preservation of federal lands. In amalgamating forest service, national parks, and federal lands had created a region of historical value and importance, preserving threatened ruins, prehistoric fossils, and sacred sites in Bear Ears that the imprudent decision to “resize” reduces it to a vestige and place-name: two buttes are isolated on the new map, stripped from the surrounding historical landscape,–as if it could be mapped on a register abstracted from time and from the rich surrounding historical and cultural setting. Bears Ears has become something of a poster child for the vision the Trump administration seeks to impose on public lands, setting a bizarre precedent for the remapping of the nation stripped from its sites of cultural memory as if to value the transmission of a cultural heritage, and rendering as much as possible of its open land and watersheds accessible to driving. –and reduced and expanse of lakes, canyons, mesa and wilderness to two oddly bounded areas of land, difficult to supervise or protect, and leave vast traces of land unsupervised and available for corporate leasing. The reactionary remapping of Bears Ears as a National Monument not only releases it from protection, but indeed rents it out for the future unregulated and unsupervised exploitation of underground resources, reducing the extent of protected lands criss-crossed by prehistoric roads below the Buttes to vestigial remains, without public consultation with Indian Nations, diminishing the 1.35 million acre monument in ways that undermine the investing of responsibility to protect the national heritage, and reducing the protected lands in the nearby Grand Staircase Escalante that extends to the Grand Canyon by a half, splitting it into three mini-monuments. The major threats to the delicate region of Bears Ears may be the arrival of tourists, and expanded access to vehicles, and the disturbances they will create to archeological complexes including ancestral cliff dwellings, delicate sandstone. Trump’s Executive Order usurps the office limited to Congress to amend the status of monuments or federal lands, by using a GPS scalpel to protect private interests of extractive industries to access its mineral wealth, rather than ensure a sense of public good. The image of the defense of a color-saturated landscape of the open west by Native American movie extras has given way to the opening of the same lands for the energy industry on the most deceitful and sleaziest sort of faux patriotic grounds. The deepest and most definitive disrespect seems its conversion to a backdrop of devastating drilling, mining, and mineral extraction. The risks of the regions pollution seemed destined to grow, and maps helped one envision the spectral landscape that might result from the appearance of oil rigs and uranium mines, methane gasses released from mined coal veins that cross its edges, oil derricks constructed on leased areas in the Valley of the Gods, as uranium loads shipped to a nearby refinery generate dust polluting nearby headwaters of the Columbia and San Juan rivers, altering a pristine landscape of sacred resonance and historical ruins beyond recognition. The limits of protections to areas defined by flat primary colors concealed the hubris of drawing crisp lines around the peaks of a landscape that retains its own integrity. This is an environmental disaster waiting to happen, in a warming world that will be increasingly beset by disasters, as well as a virtual in situ archive of fossil and archeological records–the precise rationale for which National Monuments were to be designated–that stands to be compromised if not permanently endangered by intense activities of industrial extraction that will bring increased traffic to a long-isolated area. Is this actually being re-designated as an area destined for mineral mining? Remapping the recently declared National Monument fragments its fragile coherence, by privileging the interests of extractive industries who desire the land to be leased–and the vision of energy independence that they promote as a mens to guarantee access to hidden reserves of gas, coal, and uranium that have already been mapped in the region and on the current National Monument’s boundaries–and whose extraction the designation was designed to protect in order to preserve its rich archeological record and historic spiritual value as a site sacred to its long-term residents. The National Monument was adopted by working with land management organizations, local native peoples, and interests over an extended period of time to preserve its density of sites of historical and cultural interest and fossil ruins, partly evident in an interactive map of the region’s rich geocultural patrimony and fragile ecology. The Maps for Good map sought to mobilize interest in protecting the region’s cultural landscape, registers a new sense of land use and history in an era of assigning value of land by its economic potential or underground mineral resources: indeed, the ability to transpose a leaked map, constructed on a UTM projection to the actual cultural geography of the region–not evident in the draft map of “boundary modification” leaked by the Wilderness Society–a map which failed to note any sites of cultural value–inviting one to perform one’s own archeological excavation of interests, given that areas released from federal protection correspond so closely to those areas rich with mineral deposits that the Bureau of Land Management has often already leased by extractive industries. –whose eastern border was negotiated to protect incursion into the area. The construction of the debate about the “Energy Zone” was however paradoxically effectively presented as a struggle between “local” and “outside” interests, as the designation by Utah’s legislature was cast as a decision of the County, even though this ran against many of the interests of residents in the area, and endangered historic lands long judged sacred by native residents, and filled with at risk archeological remains. One must return to the value of the dynamic counter-map whose interactive form allows one to evaluate the curtailing of the monument not only as a way to expose access to mineral deposits in its once-protected landscape, but stand to permanently compromise the region’s cultural landscape in deeply disrespectful ways. The redrawing of the danger to Bears Ears mapped from leaked maps offers grounds to reflect on the absence of public engagement in the reduced monument, its relinquishment of public responsibility, and the near-eventuality of the loss of archeological ruins long historically sacred space as drilling, mining, and increased industrial traffic will obliterate the once pristine region as it is broken up and subdivided. Indeed, they allow the public involvement through the counter-mapping too the landscape that was being erased by the restriction of the protected region of Bears Ears, to reveal the density of its cultural landscape in ways that the integrity of the monument could be better mapped–and protected–provided a framework that helped mobilize support for the monument. While the landscape of land management was created to abut a National Park and land of the Navajo Nation, creating a puzzle piece to the future historic preservation of a rapidly vanishing west, the new boundary in fact suggests a landscape that would be quite vulnerable as it would be open to immediate threats of motor vehicles at its edges and Glen Canyon area, drilling and mining from Monticello to the San Juan river, and would leave much of the region unmanaged to prevent looting and grave-robbing. –as well as the route of hauling uranium from mines in Utah across the former Bears Ears–as well as from multiple uranium mines a.com in the Grand Canyon National Park. Although the region’s designation as a National Monument is repeatedly represented as “executive overreach” from Washington, D.C., and an abusive extension of federal power, the curtailment of the monument by a dramatic 85% suggests the redefinition of “value” and who determines the “value” of lands. The dramatic extent of the curtailment of the National Monument’s expanse is not only a act of bravado that stands to reduce the protection of public lands, but a definition of their value: the redrawn or, more euphemistically, “revised” boundary of Bears Ears, or, as it is proposed to be renamed, Indian Creek and Shásh Jaa’, a toponymic concession that takes the name of the entire stretch of land, sacred to native tribes, to refer to a vestige of the site. What Interior Secretary Zinke has called the “resizing” of Bear Ears opens the area to land grabs, and reveals, in a single executive order, a massive relinquishment of Presidential responsibilities: President Trump’s announcement to curtail the monument seems to convert it into real estate, echoing Zinke’s proposal to remap our national waters by renting rights to waters off of the Gulf of Mexico, or the Alaska Petroleum Reserve. The alignment of Trump’s America First doctrine of energy independence has been claimed to be a “defense” of local interests, unpacking the agendas of industrial lobbyists is not difficulty, if the extent of pernicious dangers has perhaps not been fully appreciated as an attack on the protection of and indeed the concept of the management of public lands. Is the increased fungibility of federal lands in the Trump administration evidence of their transformation into leased properties or the Trump’s inclination to trade widely in debt? Is the value of lands parsed only by resources, or potential leasing revenues, or their use to extractive industries? The dramatic extent of the curtailment of the National Monument seems an act of bravado and a challenge to reduce the protection of public lands. For the radically reduced perimeters of the National Monument to two vestigial areas aggressively rewrote a process of the drawn out negotiations among local stakeholders–if excluding energy industries–to establish the monument out of United States Forest and land of the Bureau of Land Management, with the National Parks. The National Monument created significantly expanded the Utah Public Lands Initiative, a region local Senators who sought to transfer more protected lands to state ownership. The wars over public lands began with the radical reduction of how the former National Monument protected a region far closer to the proposal of an Inter-Tribal Coalition, in a complex of state lands, land from the US Forest Service, and yellow-hued lands of the Bureau of land Management,–absorbing lands the state long hoped to transfer from federal ownership, and which are now to be removed from federal oversight. While the proposed regions of the park mapped 1.35 million acres of federal land within its boundaries, a considerable reduction of the 1.9 million acres proposed by the Inter-Tribal Coalition, to boundaries that fit land management practices more easily than other local Public Land Initiative, the remapping seems to serve no interests save staked land claims of extractive industry. –replicates the utter absence of historical information in the timeless perspective of a GPS map, stripped of and cultural or historical relation to the terrain, or of its spiritual, archeological or cultural significance. Is it any surprise that the reconfiguration of the boundaries, described in faux disinterested corporate-speak as a “revision,” may have been managed within the soundproof “privacy booth” that the Trump administration created for the Environmental Protection Agency for Scott Pruitt at a cost of $25,000 in specially modified form to create the sort of “secured communications area” that seems a metaphor for the Trump administration’s relation to the nation? Yet for the very reason that the paleontological, archeological, and artifacts in the region have not been included in a cultural resources inventory, including the Cedar Mesa, Dark Canyon Wilderness, and White Canyon, now removed from the proposed National Monument, whose mandate seems not to reflect the purpose of the Antiquities Act and whose shrunken boundaries were never fully or clearly explained–but mandated as a fait accompli, as if to hide the true motivations for the exclusion of 85% of the lands President Obama elected to protect as a monument of national significance, but Trump has been quick to demonize, with Utah property owners, as the first battleground, as Orrin Hatch put it, “in an escalating war over public lands” and an attempt to “right” perceived damages of a new era of federal land management. For in opening access to the region’s underground mineral wealth–the “natural resources” that the Trump administration has come so short-sightedly, to prize with the same sort of righteous rhetoric of industry the the Reagan administration once adopted in loosening restrictions on offshore oil, they expose multiple ancient sites to disturbance. The Interior Department has recast protection of the ecosystem as a special interest, alien from the region. Looking at the landscape’s sudden reduction to four areass, one senses something other than the supervision of a delicate cultural patrimony or a system of adequate management of land–but rather a sort of shell game. The buttes rise majestically across the horizon line, as imposing monuments. But suddenly stripped from their territory, and isolated from the landscape, they have been re-mapped by GPS as potential vestiges of a greater national monument, removed any sense of their context for the indigenous peoples who lived there after having been chased off traditional homelands. They are removed from the delicate environment that stands to be compromised by the arrival of extractive industries to whom the land stands to be leased, as they are invited access not only to current claims but to lease further lands for mining coal, uranium, zirconium, and drilling for oil, and indeed disrupting the earth that lies beneath the Mesa and in the ravines of the region, expanding the refineries and uranium plant that lies nearby. 1. The threat of the fragmentation of the National Monument to isolated “areas” of continued preservation is a remapping of their value to the nation that conceals vested interests: with over 40% of coal in America being mined on public lands, the moratorium on coal mining declared by President Obama’s Secretary of the Interior, as the American Energy Independence invites restoring hydraulic fracturing on public lands. This makes Bears Ears a sort of talisman of the opening of federal and public lands to a laundry list of oil industry interests as if they were identical with those of the nation or the residents of the region. It is no surprise that the new remapping of the region follows the maps that extractive industries had already defined. The compelling counter-map that Maps for Good allowed viewers to explore threats to the region in an interactive form reveals the scale of proposed land change: indeed, the density of the clustering of proposed uranium mines around the earlier national monument Bears Ears is shown against the expanse of existing parcels leased for oil and gas–noted in pink–and energy development zones in light purple, giving the lie to Ryan Zink’s statement of the absence of sites for mining in the National Monument’s former perimeter. By opening the land to extractive industries, as well as its dangers form looting, off-road vehicles, and unmanaged visitation of the fragile region, whose interests the boundary of the National Monument appears redrawn to accommodate–and allow access to multiple uranium mines near or in the boundaries of the former Bears Ears National Monument. The assembly of the map from linked maps procured by the Wilderness Society with Open Street Maps data provided a way of combating the truly predatory redesignation of lands that the Secretary of the Interior has tried to perform in a quite deceptive manner, without due process or public consultation, that seems to abuse the public trust. –as an absurd declaration of victory whose theatrical celebration, Trump raising his sharpie beside the Chairman of the San Juan County Commission raising his fist, seemed a mockery of the protection of the American west. If intending to represent the local needs, Trump has hypocritically posed as defending from “outside bureaucrats,” flushed as if bemused by the fungibility of the lands previously protected by his predecessor. The local San Juan County Commissioner, long protective of their ability to invite industry into the lands, ludicrously wore a ten gallon cowboy hat to identify himself as a westerner, as Ryan Zink rode a horse to work the first day he was confirmed as Secretary of the Interior, channeling Theodore Roosevelt–the American President who had championed the Antiquities Act at the start of the previous century. The County Commission has long felt that they’ve over-accommodated native interests as well as environmentalists, and protected enough wilderness areas. President Trump seemed bemused by darn simple it was with a stroke of the pen to reward extractive industries with access to minerals and believed oil reserves. But is their remapping not a historical coup in the influence of private industries, of a piece with the offers of the Bureau of Land Management of the largest number of leases to the National Petroleum Reserve in Alaska, the identification in October of “burdensome”regulations that prevent the exploitation of actual gas, petroleum, uranium, and coal reserves, that suggest, in keeping with the America First dogma, a notion of autochthonous economic development–a philosophy developed in Fascist Italy, and with a clearly anti-international genealogy–that prioritize the interests of the oil industries by revision of what the Secretary sees as “hampering the production or transmission of our domestic energy” and a failure to manage public lands “for the benefit of the people.” Despite the broad purview of “streamlining permitting and revising regulation” of the use of public lands and waters as a form of leadership, and not an abandonment of public trust. 2. The proposal to strip the lands of monumental status uses the false opposition of the governance and the administrations of public lands in ways that conceal that achievement, however, and blind us to their future losses. Despite posing as a defense of undefined “local interests” against intrusive government, repeating the Reagan-era anti-government mantra that they stand in opposition with one another, and deny the radical remapping of public lands that the Trump administration has decided to advocate. For the proposed rewriting of the national monument’s boundaries constitutes an undoing that cannot be seen as an adjustment of its perimeter, but a breaking up of its heart. The proposed monument encompassed not only archeological ruins and fragile ecosystem, but what had been alternately designated as a “special tar sands area” by the Bureau of Land Management, quite controversially, and had been promoted to locals as an “energy zone” at a time when many pristine environments–from particularly devastating areas in the coal mined in tar sands in the old-growth boreal forests in Alberta, whose devastation has been documented in aerial photographs of Canadian aerial photographer Louis Helbig,in images of the environmental degradation strip mining of bitumen brought to a once-pristine region. Despite the promotion of a deceptive and very poorly defined “Energy Zone” in Utah, bordering the Bears Ears monument, that was suggested by the API, the assertion of economic benefits since 2015 within the American Petroleum Institute in Utah’s legislature conceals steep environmental risks of allowing extractive industries to enter the region. Indeed, given the laborious and uneconomical process of coal and uranium mining would create, the lifting of protections on the state and federal lands across the protected and ecologically delicate region- would compromise not only its National Conservation Areas but an invaluable archeological and cultural patrimony. Overturning the integrity of the region that the National Monument worked to keep by adopting the “new” boundaries would ensure open access to almost all the underground .mineral deposits in both National Monuments named by Democratic presidents in Utah, alerting the energy industry a new regime is in town, ready to allow opening up old uranium mines that encircled the Bears Ears regions when it was considered as a National Monument in the Obama administration. In ways that have treated the strike of the pen of Donald J. Trump’s recent Executive Order as a fait accompli in the remapping of the once wild west, the Bureau of Land Management has reckoned the newly redrawn mini-monuments slated to replace the Bears Ears National Monument, as two lopped off areas, newly severed from their regional surroundings, in ways that reveal the pitifully curtailed areas that are prevented from being leased by the Bureau to private industries who are eager to extract the range of mineral deposits that underlies the region dense with historical archeological artificacts and spiritual significance. The local knowledge of the native tribes that have long settled the region was over-written not only by the United States government, but by executive fiat, without any process of consultation, in ways that raise pressing questions of the future of land management, the preservation of space, and the ecological intactness of the region. Unlike the multi-year process of crafting a consensual administration of public lands in the historical Public Lands Initiative, embraced by now-disgrace Utah Senator Jason Chaffetz, the circumventing of community interests has been revealed to follow the interests of multiple extractive industries–miners of veins of coal, old uranium mines, and possible oil deposits–that lie in lands already leased from BLM by industries, but whose arrival in the region with projects of strip mining and extraction were forestalled by the declaration of the region as a National Monument. The compromised status of the vestiges that stand to be accorded the status of federally protected monuments indeed call into question what are the rights of locations or local inhabitants in the process of monument designation, now seemingly removed from a consensually crafted process to a caving into the vested interests of industry lobbyists who have determined with their own maps of natural resources to provide the template of what qualifies for recognition as a monument. Is it any coincidence that this has occurred in a Trump era, dominated by a President who spent most of his life interested primarily in projects of self-monumentalization in an urban area, who sees little need in ever visiting or setting foot in the two regions–Bears Ears and the Grand Staircase-Escalante Monument–that his predecessor and Bill Clinton had both declared. Downsizing the National Monuments–or demoting them as monuments–maps a huge betrayal of the public interest. The radical rewriting of the national monument into conservation areas peels back the bridging of area around the buttes and the unique public lands arrangement that had been arrived at with local interests over time, but stands in contrast with the gold-tinged layer that the Utah legislature adopted, with few real reasons, but with the endorsement of the American Petroleum Institute, identified a poorly mapped “Energy Zone” colored a seductive gold on the east of Highway 191 to be “streamlined” for quick development–as if the gold could be readily found beneath its surface, and easily extracted, reminding us of just how easily maps lie and paper over interests–and of how strong the myth that “there’s gold in them thar hills” can still under-write a relation to space. The gold layer is not transparently scientific but impose a golden layer atop a topographic survey as a counterweight to the Public Lands Initiative that advocated the creation of Bears Ears. If the Initiative approved by a supermajority of residents with the twenty-five native tribes whose deep ancestral relation to the land, the “Energy Zone” was something of a conscious reference to the mapping of a new “Gold Country,” apparent to all if one could only excavate the earth, and presented in 1849 as “the El Dorado of the gold mines,” promised to contain gold nearly as high quality than United States coin in ways verified by the United States Mint–in order to similarly superimpose the lure of economic interests in a layer atop the region’s map, in ways that suggest how economic interests of the concealed underground can trump the accuracy and all other meaning in the map. In ways eerily comparable to the mapping of the California Gold Rush in magnifying the immediate gain over both the inaccessibility of the region and the long-term costs of the operations, cartographic creation of imagined geographic “Gold Regions” during the Gold Rush. The notion that such regions partly lay within the boundaries of the then-proposed national monument suggested a compelling lure, designed to be displayed to attract interest and entice miners to fix a destination in their minds in terms so powerful to trigger transcontinental migration. The designation of the gold hidden in the Sierra mountains–and offered potential routes of arrival from other parts of the world to prospect the gold that was hidden beneath the ground–could be a model for the compelling maps of areas that Petroleum Institute lobbyists convinced the Utah legislature to designate an “energy zone” where environmental regulations could be “streamlined” for reasons of the promise of future economic development, even if it would potentially compromise the natural landscape in regions surrounding or within the proposed monument back in 2015. 3. Is the curtailed national monument a similar counter-mapping, now endorsed by the government responsible for representing the stewardship of the land? Or does it openly betray them, by following a map to advance short-term personal and corporate interests, against the public good? The deeply suspicious suggestion of the promise of such an “Energy Zone” seems to update the promise of “god in them thar hills,” and to eclipse a democratic process of local land managment. By “streamlining energy development” in southeastern Utah, without any vision of costs or consequences of such development for the land, it erases a region not only among the most pristine in the west but densest with memory. Is this a step in the war against the memories of the relation to the land? The hope to imagine the preservation of a region whose canyons, ridges, mesa and basins are rich with artifacts was evident in the proposal to create a counterpart to Grand Staircase-Escalante National Monument, created by President Bill Clinton in 1996, the current proposed curtailment by GPS clips a historical landscape to two vestiges of what have become highly politicized federal lands. Yet the currently proposed fragmentation of what seemed a groundbreaking advance in the management of native lands–joining members from five tribes with members of the Bureau of Land Management, National Park Service, and U.S. Forest Service, to recognize its identity as tribal lands and relation to a National Park–rejects a notion of land stewardship by resurrecting a battle between ‘locals’ and ‘big government.’ The “fake news” of such a loss of local interests would stand to permanently reconfigure the pristine open lands around the Four Corners region of the nation, in ways unable to be measured by the size of the original Monument, in ways disguised by debates about its boundary line. If all of these lands are–and will be–federal lands, the opening of these lands to federal leasing is what is at stake by the removing designation of the National Monuments, which would expose them to extractive industries. As the new boundaries of the Grand Staircase-Escalante leave all coal in the region open to strip mining and extraction, and allow easier access to those areas lying just beyond the National Monument, the scaling back of both monuments seem to respond to directives of corporate lobbyists, from a uranium processing mill that sits outside Bears Ears to the American Petroleum Institute, representing firms who have purchased leases on sites within the monuments’ boundaries from the Bureau of Land Management, which did not evacuate them after the national monument was declared. 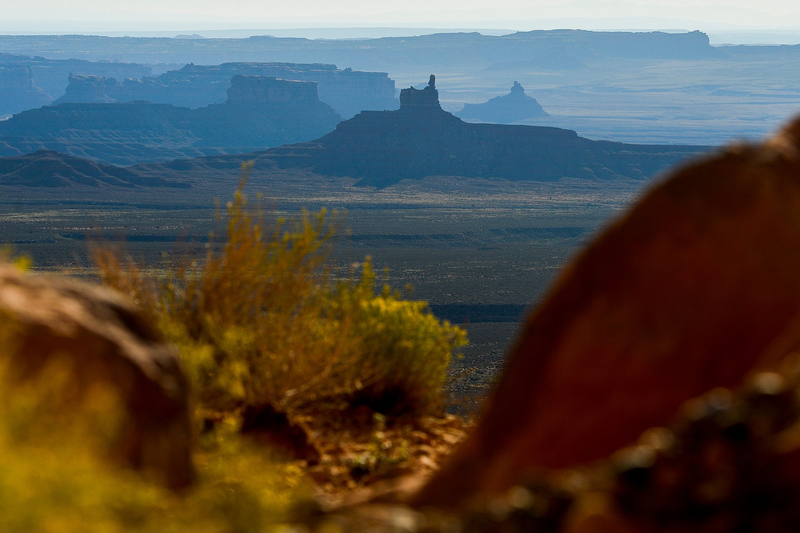 The premium that the American Petroleum Institute places on the need to “recognize the importance of our nation’s energy infrastructure by restoring the rule of law in the permitting process” in the words of its CEO and President, Jack Gerard, prioritizes interests that were not addressed in hopes to rewrite the Bears Ears cultural landscape, and evacuate the conclusions of the local Public Lands Initiative (PLI) that resolved the many stakeholders’ interests in the pristine lands–and in the future of one of the largest open spaces in the American west. By recasting the monument’s creation as an act of “big government” that infringes on the land rights of local residents, the Secretary of the Interior has adopted the points of interest defined by extractive industries–the promise of oil; $11.4 billion tons of coal; and unspecified amounts of zirconium and uranium in the northeastern region of the Staircase Escalante–without the consultation of local tribes who hold the ancestral lands sacred, or indeed local communities. Indeed, the remapping of the region erases their historical significance, which it wipes from the map. It is worse than a give-away, as their extraction would irreparably ruin the area under which they lie, if the quality of such deposits is often poor, and whose promise seems to have been magnified and poorly balanced against the costs of their extraction and the industries, pollution, and indeed toxic waste that this would bring to the region that seems likely to be converted to a Superfund site. Indeed, the proposed dismemberment of Bears Ears reveals a struggle between two forms of mapping of the region. One map attends to the cultural landscape and local ruins; the other privileges the “energy zone”introduced in the Utah legislature in 2015–and proposed by the American Petroleum Institute, who first vigorously called for reviewing the Antiquities Act to prevent its abuse for political ends. While posing as the “local interests” of the region, they have advocated exploration and leasing of the 105,000 acres along the eastern edge of the monument already claimed for prospective leasing by extractive industries–since 2013, claims that run across the designated National Monument, and whose leasing and examination would bring the construction of roads, equipment, rigs, industrial workers, and mining plants on the border of the current National Monument–and have already been auctioned to firms like Hoover & Stacy and Kirkwood Oil and Gas, per public record, or other energy firms like Energy Fuel Resources (USA), whose Canadian COO Mark Chalmers cautioned the Interior Secretary this past May 25 letter that preserving the 1.35 million acre region would compromise the nearby uranium mill operations. Does the curtailed monument more closely correspond to outside vested interests, and betray the governmental and representational function of the nation’s government? Indeed, the continued interest that extractive industries have raised to the Utah Bureau of Land Management to lease 105,000 acres lying in or immediately proximate tot he current National Monument–and which encouraged its designation–the leases to some 88 have been reactivated by ending Bears Ears’ status as a national monument. Such claims in line with Donald Trump’s America First Energy policy–and the promise of energy self-sufficiency–seem to mask the private value that are at stake in exposing public lands to the mining of uranium, zirconium, and coal. Indeed, the underground presence in the region of “precious natural minerals” seems to blind the Trump administration to preserving the cultural value of the monument. During Trump’s recent public appearance to sign the Executive Order in Utah’s state capital, he pointedly didn’t visit the land: the slightly coded reference to claims of the company running the last uranium mill in the United States bordering the monument, Energy Fuel Resources, who have also targeted uranium reserves in the Grand Canyon region. (Fuel Resources have tried to reopen sites in the Grand Canyon that they earlier ran, prevented in courts by the Havasupai tribe who have organized a campaign to stop mining in the Canyon. Work on the mine came to a halt again in March when the site began filling with water.) Although Grand Canyon Trust has been concerned of possible pollution of aquifers from existing uranium mines by the same company, which failed to test the quality of water near its mines, the poor history of stewardship of lands raise questions of the similar contamination of the San Juan and Colorado Rivers bordering Navajo lands–as the mining would open the landscape of Bears Ears to levels pollution not only hypothetical, but evident in the landscape of the unregulated mining of uranium has already created the Grand Canyon. Indeed, is it any coincidence that extractive industries of mining and mineral deposits specialize in a quite different form of subterranean mapping, isolating unseen underground wealth from a landscape while spending less attention to visible markers or history? The Bears Ears uranium deposits–a subject now on Trump’s mind, perhaps, if for the wrong reasons–have made the monument appealing site to allow extractive industries now prevented from working on National Monuments, many of whom have already staked claims in prospecting maps of what is cast in code words as “valuable energy and mineral resources.” But is the leasing of federal lands–whose monumental value is evident in the unprecedented wealth of archeological ruins and old-growth forest an the start of the San Juan river–able to be sacrificed for what lies underground? Or is it that the mapping of the underground minerals have somehow, in a circuitously evil fashion, come to replace the image of the lands before our eyes? If so, the costs of such a substitution are not only high, but suggest a massive act of deception and abuse of public trust on the scale of which we haven’t seen for some time. It is hardly a coincidence that the American Petroleum Institute first concentrations asked Trump’s administration to “re-examine the role and purpose of the Antiquities Act,” in a way that targeted the legislation that Obama had used. Rather than change the purpose of the Act, however, the Trump administration has sought to evacuate its meaning. Indeed, and ignore the preservation of sites of cultural wealth or significant. Indeed, the Secretary of the Interior seems to have replaced existing maps of the monument with the map of the infamous “energy zone” presented to the Utah legislature in 2015 that encouraged the Utah Bureau of Land Management to auction off parts of the region–a very broad brushstrokes data visualization, more suggestive of a buried treasure map, that entices the viewer by adding a layer colored suggestively in gold above the green topographic map of the region, which effectively superimposed economic over ecological rationales. Such a proposal was indeed a thorn in the side of the plan that local stakeholders sought to work out between 2013-15 in the potentially flawed Public Lands Initiative, but sought to start a legislative runaround to foreclose its role in the administration of public lands. 4. The map is an adequate metaphor of the blinders that the interests of extractive industries to target federal lands–and the Bears Ears monument–to access to what lies under it. Was existing GPS mapping of points of particular energy significance by companies who have auctioned claims from the Utah Bureau of Land Management the very basis for leaked maps from the Trump administration, whose curious form and the precision of whose UTM projection seem the fingerprints of existing interests of extractive industries? Were the plans for future prospecting and exploration by extractive industries the basis for the redrawing of the perimeter of the National Monument as two plots, removed from the sites of the greatest interest in energy exploration? The shrinking of the National Monument certainly suggests the prioritization of energy interests above the local cultural landscape. 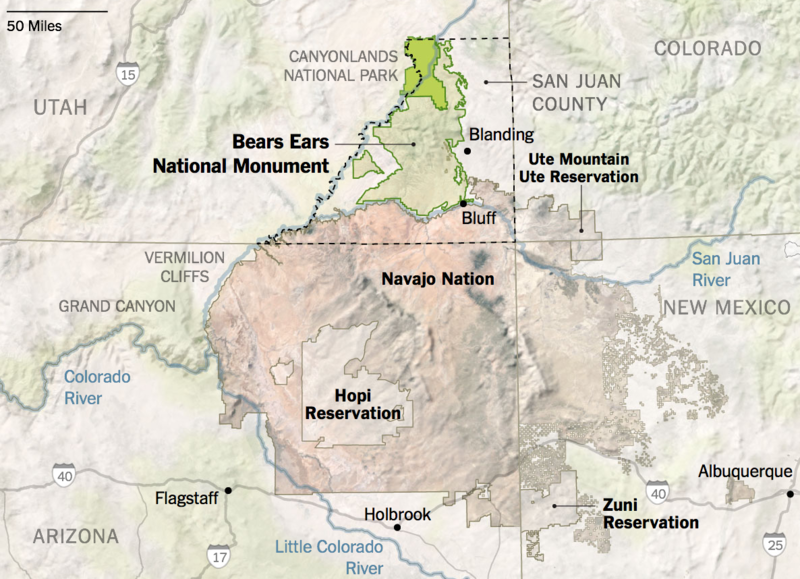 To be sure, the imposition of the layer of gold obscures the complex tapestry of claims of ownership in the Bears Ears monument–and the deep confusion between a clear dominance in the overall picture of native claims, marked in lavender, in and around the 2,112 sq. mile area of Bears Ears from the claims to oil and gas development and coal and uranium mines near the park, that seem to have catapulted it to the attention of the Trump administration and Secretary Zinke, and led the entire congressional delegation of the state of Utah to oppose the designation of the National Monument. To be sure, the maps prepared by extractive industries suggest the unprecedented scale of landscape modification at stake. For in defining the remapping of the lands as protected parcels, to prevent future disturbance or excavation, the act brought them into federal jurisdiction: rather than “governmental over-reach” infringing on “local” claims to land use, the clear desires of accessing what lies in the ground–as the coal fields that lie beneath the Grand Staircase Escalante–of which USGS had already determined some 11.4 billion tons were defined as able to be removed. If the preservation of the National Monument protected these mapped deposits from being accessed, the anger that they’ve created among extractive industries who have long lobbied for access to them, and recently heightened their efforts: the review of monuments was pushed heavily by Energy Fuel Resources, the uranium company, even though the price of uranium is far below what would make the mine profitable and coal mining would devastate the region’s pristine integrity, and most probably create it as a series of Superfund sites. 1. Did not the unprecedented reclassification of the National Monument in fact represent an extension of claims to injure–if not destroy–the integrity of public lands? For while the rhetoric of liberation was used to describe the proposed redrawing of the National Monument’s boundaries, the new boundaries on Bears Ears seemed drawn only to allow increased access to underground mineral deposits and veins of coal. Indeed, the cursory shrinkage of this monument, redrawn from Washington, D.C. by the Department of the Interior with little consultation on the ground, save from the Utah Senators who were angered by the declaration of the monument during President Obama’s final term in office, removed many of the more precious archeological sites and sacred places on federal lands, and exposes them to potential leasing in ways that speaks volumes to two different visions of the relation of the office of the President to the land, if not the imposition of a form of GPS mapping, conducted offsite, without any actual assessment-as none has been completed–of the cultural resources in the declared National Monument. Despite the rhetorical power of these maps, printed in The New York Times, the startling omission of the private interests of energy companies and extractive industries fail to provide a sense of the clear motivations behind the rapidly announced reduction of protected federal lands, and fail to map the future that we can expect the arrival of extractive industries eager to expand their operations into leased lands around the former National Monument. Indeed the acquisition of future oil fields, sites for uranium mining, and sites for coal mining, all leased by the Utah Bureau of Land Management, as well as seismic studies for future oil wells, stand as a nefarious proxy for the “local interests” that Zinke and Trump evoke. suggest that an intensive mapping of the area that the restricted boundaries of Bears Ears and the Escalante directly correspond–and the distance of these maps from knowledge of the site’s cultural legacies. Indeed, the shrunken “revised” boundaries would take pronounced bites out of the wilderness regions but also the eastern side of the Monument, to expose the Dark Canyon Wilderness to through traffic, including transportation of uranium to the White Mesa uranium mill on the former National Monument’s boundary. The proposed clipping of Bears Ears to a vestigial “units” of the buttes and one rock ridge would invite the reconsideration of leasing other lands, in ways that are indeed far more circumscribed than the Public Lands Initiative which preserved National Conservation Areas (shown in blue) and wilderness areas (shown in purple) within the Bears Ears National Monument. 5. But the redrawing of boundaries supersede agreements to protect the lands in a collaborative manner with Navajo and Ute Mountain Ute tribes, and indeed vacates their voice, as well as not incorporating lands rich which symbolic and archeological significance. In critical ways, the rapid redrawing of boundaries appear to have been drafted with little attention to the demands of landscape management, interests of local tribes, or the geographical integrity of the site or of its cultural and historical status. For the proposal would break up the historical unity of the monument that was created by the last Presidential administration definitively; the move to strip the lands of their designation as a national monument undoes the unprecedented recognition of the lands’ value that extend beyond historical or archeological reasons, but ignores its historical significance for native peoples who have long regarded it as a spiritual home, and leave much of the formerly protected lands newly vulnerable. The proposed remapping of its boundaries undoes its integrity, by opening areas of the National Monument as property that the government can lease, undermining its cultural and historical value in ways that sets a precedent of reclassification that stands to threaten all public lands–as they stake a challenge to redraw the boundaries of federal lands to facilitate their leasing in ways that would forever compromise local landscapes. Indeed, the UTM projection that proposed to dismember Bears Ears as a monument was drafted offsite, in Washington, DC, with attention to the recent 2017 evaluations of the density of mining resources within and on the side of the current National Monument—-as if to prepare for mining claims in the wilderness preserve, from the American Petroleum Institute, Energy Fuel Resources, and energy corporations like Kirkwood Oil and Gas, who leased areas near the monument from 2013, and the Wyoming firm Hoover & Stacy, who have leased four parcels in Bears Ears in 2015 from the Utah Bureau of Land Management, lying just outside the Monument–and other energy companies who have requested leases on or near the same public land. (Kirkwood long chafed under the Obama era regulations against methane leaks; Energy Fuel Resources is eager to expand production and urging the rolling back of mining moratoria, after Obama Interior Secretary Salazar stopped uranium mining in the Grand Canyon in 2012; Hoover & Stacy have made over twenty bids on public lands in Utah and Wyoming, as have Kirkwood in Nevada and Wyoming. 6. Such a broad evacuation of the monument’s designation would rob it of its historical and archeological as well as its deep significance and shared cultural meaning as a place, denying what was long understood as unique. Indeed, the very GPS tools used to remap the boundaries of the monumentsparadoxically works to erase any sense of their historical or cultural value, treating their boundaries as land parcels stripped of cultural or historical value. The very tools of GPS help to trump local knowledge, and indeed to impose a new design on a landscape filled with archeological ruins and significance, whose survival is deeply tied to its remove from development, The mapping of new boundaries will break up a complex territory. For by remapping a region filled with historical markers of its inhabitation, and recognition of its spectacular majesty, the redesignation of Bears Ears would fundamentally and irrevocably change it as a place–and treat it as yet another fungible parcel of property by a President who seems to understand his role as Realtor in Chief. President Obama’s recent but timely designation of the National Monument as a national monument raised the level of land management and standards of preservation of the area around Bears Ears for future generations. In preserving a cluster of lands of deep historical and spiritual experience, the declaration reflected consideration of the density of ruins as worthy of protection of historical and scientific interest has provoked calls for retiring the Antiquities Act. and President Donald J. Trump seems intent to grant entry into archeological sites and recreational spots, and indeed on giving away a historic and very delicate part of the western landscape: indeed, by remapping the same parcels recently status by public proclamation as parcels to be readily leased, and open to excavation in ways that will disturb their historical fabric. Although courts have resisted any “prob[ing] the reasoning which underlies” designating national monuments as a form of intruding on executive decisions or the legislative process, the invitation that Donald Trump made to his Secretary of Interior, Ryan Zinke, to remap federal lands as public properties reveals an overreach from Washington using GPS serves to shift judgement of the value of federal lands from their historical or cultural grounds. Is there a way that the very mapping tools used to revise such monuments’ boundaries works to remove them from grounds for judging their historical value or legacy? By aggressively reducing the borders of the former National Monument, lined below in black, carving two small patches of quite unnatural compact size out of a broad complex. While the monument is closely located nearby the Canyons of the Ancients, Mesa Verde National Park, and San Juan National Forest. Increasingly, and even at a short distance of time, the threatened loss of Bears Ears seems not only a desecration of the commons, but a metonym for the abandonment of public lands to private interests, and the break-up of a contiguous set of public lands that was once defined by the scale of its integrity–the National Monument was among the top 10% of regions of such size in the West for ecological intactness and connectivity, and the severing of its regions into two separate monuments will not only decrease their monumentality. But it will also definitively compromise their unique value as a coherent historical landscape: the break-up will challenge both the landscape conservation of the region that has been achieved, and the biodiversity of an especially fragile ecosystem. This is not only about monuments, but about rewriting the landscape. The arrival of any sort of industry in an area which was classified as being in the upper 4% of global stellar visibility in an ever-brightening world. The extremely low light pollution would be irreversibly compromised by the arrival of industry–as environmental pollution and even levels of radioactive dust–would compromise the historical setting. While the region’s status as a National Monument is cast as a dodge for environmental regulation within its boundaries, the adjustment of these boundaries exposes it to untold pollution. Might we consider the need to redefine the meaning of a National Monument to include a broader compass and more ethical standards of land management than when it was framed in 1906–by standards taking into account new environmental stresses that extractive mining or strip mining place on historical lands–rather than fetishizing the isolated points? 7. The extent such an unprecedented act of reducing a National Monument cannot be counted in acreage, or even made visible on a map. For it stands to entire rewrite the landscape and the ecosystem of which it is part in ways that we cannot fully measure, as we are essentially inviting development up to the limits of the current proposed boundaries–even permitting the leasing of land between the two rumps of the Bear Ears National Monument that now stands. Indeed, the ability to map at a remove of its landscape–despite Secretary Zinke’s earlier promise to visit the region–suggests a sort of blind mapping, at a remove of the landscape, of the sort that GPS can allow, and transforms the status of a National Monument–a designation that is quite thought out and was explained in detail when it occurred–as a fungible piece of realty in ways we could only be able to expect from Donald Trump’s Presidency. The prospect of opening the ecologically intact region to leasing would end the environment–the character–of the place which was declared a National Monument, and not only awe-inspiring but sacred to many, as well as a site of historical inhabitation whose wealth demands to be defended by the government–not squandered. The proposed restriction of the monument to vestigial outposts robs it of not only of archeological sites in need of preservation under the guise of “restoring” it to states, but revises claims to preserve the common or historical area of the monument. The unclear status of the Wilderness Areas that had once expanded beyond the National Monument of Natural Bridges over a broad area is no longer permanently protected; the vestiges would be far removed from the headwaters of the Colorado River, and set a dangerous precedent for altering land management policies in complex ways for unstated reasons, but whose exposure of coal veins and future possibilities of prospecting will damage its integrity in due time. Donald Trump famously enjoys thinking in terms of monuments and monumentalization, and even hopes that the proposed Border Wall between the United States and Mexico might be named after him. The reclassification of the national monument had never been attempted, even by a President; the request to review the status of national monuments recently designated by the Antiquities Act we perhaps had better taken stock of the potential consequences of requesting such a review, as it seemed to elevate the power of the Secretary of the Interior to undertake a housekeeping of lands named by Presidential authority that had been characterized polemically as “land grabs” of unilateral nature, denigrating the motivations behind their designation outside of any process of review that would not be interior to the executive–or able to be accomplished by an executive order, Trump’s favored means of public communication. Such unprecedented revoking or the status of a monument in quintessential Trumpian fashion. For not only does the practice remove cultural wealth and natural beauty from protection, but erases their preservation as a region next to adjacent Navajo lands, often not even noted on most maps of Bears Ears. The precedent that this offers for actually revising the boundaries of National Monuments–as if this were a means of keeping house–disguises the reconfiguration of a territory that was designated to be preserved for its unalienable value to the nation, and converts it to real estate that might be leased to the greatest bidder, and whose underlying mineral or gas resources are sufficient to lead us to a path of greater energy independence. Remapping the delicate complex system of ruins by 202,000 acres so radically might be best understood as a breakup than a simply “revising”their boundaries–the intentionally vague recommendations Zinke issued as recommendations for the future of six national monuments in the early fall that stand to alter practices of land conservation in the American West. Indeed, by removing the Cedar Mesa and Elk Ridge landscapes from the status of a national monument, the landscape will no longer be coherent. Those regions subject to robbery, theft and looting each year, per the Native American Rights Fund, will once again be exposed to vandalism, and lack integrity within a particularly delicate landscape and ecosystem. The recent concentration on a single Navajo claim–using the Navajo name for Bears Ears–Shash Jaa–includes the impressive Bears Ears Buttes themselves, parts of the Mule and Arch canyons, and the Doll House and Moon House ruins–previously been designated monuments but which Obama had singled out for preservation as sites of “objects of historic and scientific interest”–and the very oldest archeological site in Utah, but excluding the region known as Valley of the Gods, Glen Canyon, in radically disjoined regions that seemed mapped by satellite in Washington. Despite the new names for the areas accorded monumental status, the exposure of the adjoining lands to prospecting and extraction–opening former mines, expanding the traffic from coal and uranium mines to stations near the park where they can be purified, and perhaps the construction of a pipeline through the former park–are certain to generate considerable atmospheric pollution. In a bizarre rewriting of the fate of the benefits that the Osage nation’s gains from oil on their reservations, which produced more wealth than all gold rushes combined, and led to the Indian Territory Illuminating Oil Company, until it lost its right in 1916, native nations will be prevented by the Bureau of Land Management from benefiting from their proximity to mineral wealth and oil, although they will suffer its intrusion. The ruggedness of the lands here is not clear from the map, but few familiar with the site can make sense of its new divisions as a monument, which rather than connect sites and spaces break up a formerly integrated unit of land management, using tools of mapping that seem to take pleasure in opening up the largest possible land for leasing. Even if there aren’t reported gas and oil resources in Bears Ears, the cutting up of the monument would set a precedent for relinquishing responsibility of land management and seems designed to allow the expansion of exploration of the Plateaux’s coal seams, evident in the significant regions proposed to be demoted from monumental status. The evacuation of the status of a Monument was performed by a President acting as lord of the domain, or sole property owner of a region, even if the concept of land management was carefully refined over time. Indeed, it serves to place as much land on the market for future prospecting, under the presence of its liberation. The location of a considerable amount of the mineral resources, quite predictably, precisely between the two new, reduced monuments–and immediately outside the park. The high risks to mineral development–in the seventieth percentile of similarly sized regions of the American west–measures the almost magnetic attraction of the region to extractive industries was long known, but to suggest the deep dangers to the local ecosystem but potentially to the groundwater and headwaters of the Colorado River and Grand Canyon. –would only invite mining claims to arrive in an area whose coherence is preserved by its status as a National Monument–not a wilderness preserve. 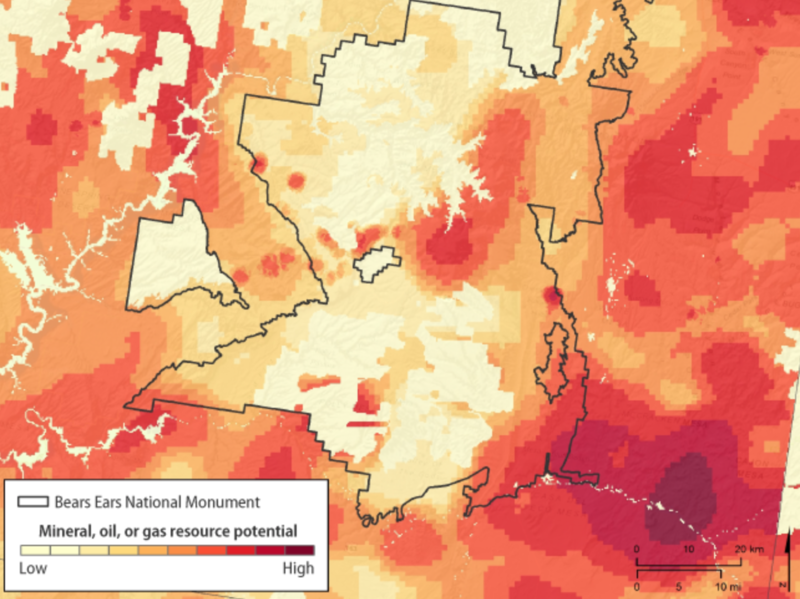 The density of such a mapping of potential resources in the same suggest the exact importance of creating such reduced national monuments focussed on areas of limited potential resources. Indeed, the strong interest that extractive industries have shown in laying claim to the region, and their release from any obligation to give revenue from their prospecting to the state or nation, is mind-boggling as a give-away to special interests, as if Trump were readying to grant a Christmas present to the benefactor of his campaign or to the so that just outside of the newly proposed “Shash Jaa” Monument will be able to be sold and mined for coal, a deposit to which Trump’s ego and identity seems to have been closely tied: the leasing of lands for future extraction in the broken up National Monument will have been enabled by the exit from the Paris Accords, in other words, and seems designed to release greenhouse gasses in the long term, both from the coal mine methane released in the practice of mining, which has effects over twenty-fold more significant than carbon dioxide, as well as in the greenhouse gasses released in burning mined coal. The opening of the National Monument stands poised to be a gift to a coal industry that is not in itself money making, in other words, but which the Trump administration seems eager to subsidize by proposing the irrevocable give-away of a National Monument. Although Zinke and Trump have both prepared a bucolic vision of the arrival of animal herders, the actual audience that stands to benefit from the redrawing of the boundaries of the monument is quite different, and far less local. 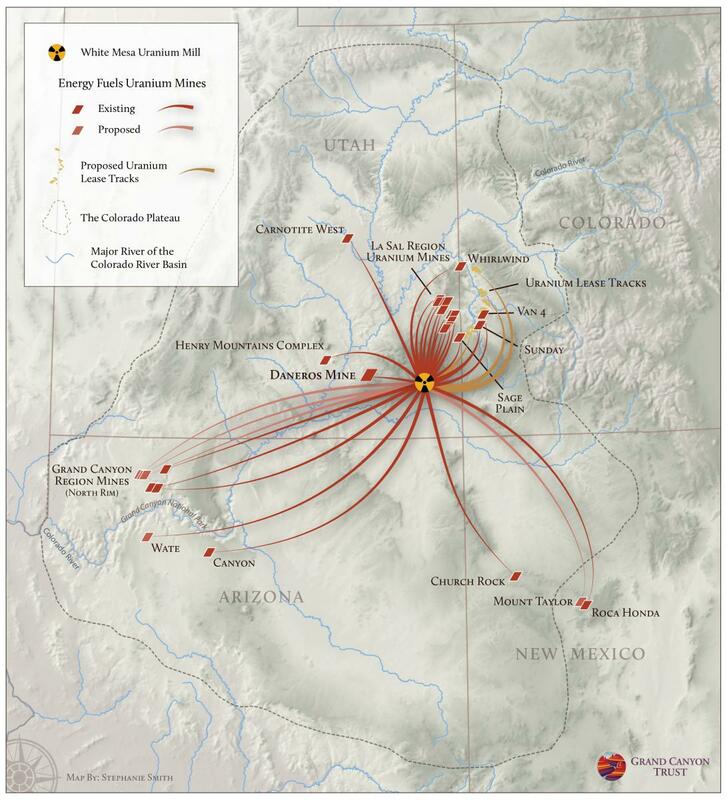 Indeed, the clustering of old uranium mines around the targeted Bears Ears national monument, shifting from a data visualization to an image of former and proposed mines that would serve as sites to carry mined uranium to the White Mesa Uranium Mill, stand to disperse radioactive dust across the landscape, and constitute a veritable mini-industry of uranium production the stands to redefine the landscape of southeastern Utah around an energy market over much of the Colorado Plateau. 8. The expansion of Presidential authority to redraw federal lands, including canyons and gulches of astounding natural beauty, actual golden arches carved into the sandstone of the Colorado Plateau, including Anasazi areas in Elk Ridge, seems to undermine public lands protections. Giving the vestigial area a Navajo name seems to assign it importance only for one constituency–reducing the status of land protection to a question of balancing individual interests, rather than historical significance. It seems to follow suggestions of the Republican Senator Orrin Hatch, preserving prominent ruins as state monuments, but stands to reduce the remoteness as publicly protected lands, rewrite policies of federal land protection and open possibilities for their future parcelization, and the consequences that this would have on the region. In claiming the role of a liberator who was able to roll back the limits of federally protected lands, under the legally dubious instrument of yet another executive order, President Trump staged the predesignation of Bears Ears as reduced perimeters of new “Shásh Jaa'” and “Indian Creek” monuments, quite misleadingly, as a defense of local interests. But presented as an action against the dangers big government, in a standard pitch of an old Republican party, it seems more like a land grab by Washington. Even if the declaration decidedly illuminates the increasingly transactional notion of the Trump presidency, shrinking the National Monument was cast as promoting needs of rural inhabitants, cleaving the nation yet again between the rural interior and coastal elites, in another Trump trope that has been returned to over the past year to portray him as a custodian of the common man. But rather than preserve these lands for grazing, pasture, or logging–industries that are not exactly booming, and would be pretty out of place in these arid plains. The targeting of Bears Ears cannot be seen as pure Trump, but reflect the earlier executive order that invited Interior Secretary Ryan Zinke to review all national monument of an area greater than 100,000 acres. It undoes the preservation of lands established during the previous four administration, in the name of hoping to “end these abuses and return control to the people, the people of all of the states, the people of the United States,” trying in any formulation to identify himself as a populist. But Zinke, eager to exploit hidden fossil fuel resources in national public lands that were placed off-limits since Teddy Roosevelt, has already gone further and proposed reducing two more National Monuments that are rich in mineral resources–Nevada’s Gold Butte and Oregon’s Cascade-Siskiyou–although the proposed reductions in these other national monuments is not public, perhaps until the trial balloon of Bears Ears is fully processed. Zinke earlier came up with a group of choices of monuments to reduce, but Trump may well have chosen the first, relishing the poetic justice of and carefully manipulating the possibility of some public support for dismantling one of Obama’s final hopeful actions. In doing so, as has been observed, President Trump proudly jettisoned recommendations of the Public Land Initiative maps made in Utah that the state keep the entire Cedar Mesa–an area of land extremely rich with archeological ruins, and was farmed from as early as 500 BC by ancestral Puebloan community, and constituted the richest site of archeological exploration; the region is to be protected as a Wilderness Studies Area, but will be left increasingly vulnerable to pillaging as it lies between the two hived off sections of Bears Ears, and disrupts the exploration of its cultural continuity as a site of land use rich with remains of patterns of habitation through the mid-thirteenth century AD. However, with the impunity of a GPS scalpel, unable to register regional history, the question of the rich historical legacy of the lands was tabled by carving by unclear logic two isolated peaks as the sole vestiges tof what was once was championed as the legacy of the Obama presidency. Indeed, by isolating the two geological formation without the landscape of hidden canyons that surround the expansive area of preservation. In so doing, he has reduced whatever mandate of preservation Obama had bequeathed to one of far smaller scale, and discounted the heritage or cultural importance of the monument as a region and its historical legacy as well as a preserve of unquantifiable value. The recent discovery, for example, of fifteen perfectly preserved maize cobs 1,900-year-old, but kept in the dry desert cave in Utah, provided insights into the resilience with which tropical maize adapted to temperate growing conditions of high altitudes, almost two thousand years ago, before their agricultural adaptation, as their genomes could be sequenced, offering something of a portal for time travel to an earlier era to compare traits of corn an early stage of the domestication to modern strains of farmed corn. The disruption of an area would sacrifice a “three-dimensional data trove” for archeologists that preserved multiple otherwise easily perishable objects and artifacts–from feather blankets to baskets to cobs–in an entirely undeveloped landscape in an arid plateau like Cedar Mesa. The breaking of the region into two units would fragment the actual intention and achievement of naming the National Monument. To do so runs against the original intent of naming the region a National Monument. Immediately after Obama declared his intent to use the Antiquities Act, Utah Senator Mike Lee had inveighed against the preservation of these land by executive fiat, which he argued overrode the will of the “people of Utah,” and revealed executive overreach. “This arrogant act by a lame duck president will not stand,” he claimed, vowing to “work tirelessly with Congress and the incoming Trump administration to honor the will of the people of Utah and undo this designation.” The rhetoric of undoing the designation of a monument, long in coming, was way overblown. During his confirmation hearings, Secretary Zinke, tried to give the appearance of tempering it when he assured Senators he would visit the monument at first hand, and would “talk to people on the ground” before he undertook to “make a recommendation to the President.” He famously rode a white horse to work on his first day, more for a photo op than to actually follow the preservationist agenda of Theodore Roosevelt. He seems to have come to the decision quite quickly. Eliminating a region designated as a national monument is unprecedented, but was done so surgically that the landscape seems to have barely been taken into account. Despite the preservation of some of the most iconic parts of the monument in two monuments of enormously lesser size, there is no grander vision in the decision to preserve lands, as it only seeks to accommodate interests of industries that have no appreciation for the place or its contents: if the new boundaries would preserve the ancient petroglyphs on Newspaper Hill, they invite raiding of the most precious archeological sites, and show no concern for the canyons where the Navajo once, having been driven from native lands at the end of the Civil War on forced marches in 1864-5 as the US Government forcibly displaced 8-9,000 far from the lands that they had historically occupied, took refuge. The forced march across over 3,000 miles granted the area deep status as a refuge. It is tragic that the proposed lines of the monuments reduction drawn by GPS advance interests that would shrink a region rich with of prehistoric ruins by 85%, endangering in situ petroglyphs in Newspaper Rock that stand to be mapped in the reduced monument proposed to be renamed “Indian Creek”–but excluding areas of majestic sheer rock, sandstone gullies, and canyons, as well as sites of immeasurable historical and archeological value. Among those sites proposed to be removed from monumental designation are, for some reason, the pictographs at Grand Gulch. The drastic plans to shrink the monument seems to have suitably Trumpian proportions–as if it was part of a massive downsizing project, using tools of mapping to perform the sort of theatrical de-monumentalization of the sort that a Donald J. Trump must take a particular obscene pleasure–and not only to gloat over his predecessors’ cultural legacies, and to deny them the status of making monument that is bequeathed on Presidents, and to reserve the right to make two far smaller monuments, now renamed . But if the goal is to demonize big government and regulation, Bears Ears may be but the case in point, as it threatens to shift much of the area’s land-use designation, and effectively open it to potential prospecting, as the designation of Areas of Critical Environmental Concern are open for review, and Wilderness Study Areas may be stripped of protection by Congress at any time. The new ability to act on leased claimes in the area deemed worthy of preservation and historical and sacred value–the Valley of the Gods, and the canyons of the region’s unique landscape, served to radically reduce the scale of contiguously protected lands whose odd boundary modification opens sites for looting, pillaging, and theft by disregarding their historical and spiritual legacy. Is the appropriation of lands a final culmination of disenfranchisement of the native tribes who have worked systematically for so long to preserve the region rich with specific memories, in ways that fail to register in GPS maps that focus on its mineral resources? Indeed the failure to appreciate the danger of increasing vehicular access, road traffic, and industry at the sites for future coal and mineral mines in the region will transform the landscape immediately adjacent not only to Native Lands, but National Parks and Wilderness areas whose level of pollution is now all but destined to escalate rapidly in coming years, as multiple extractive industries relocate to leased lots in the region. 9. What was once a monument–and will still be in the eyes of many–has been temporary massively downsized and circumscribed, as if to minimize whatever Trump’s now-forgotten predecessor had hoped to remain untouched by his successor, and had every right to expect being accorded that respect. But the relishing that Trump showed in the recent proclamation to opening the lands goes beyond vendetta, and approaches a model of auctioning off of public lands and resources on them. For the decree opens an assault on the idea of the commons, which animate public lands, as much as a waging of wars of Barack Obama’s legacy, no matter how much that may sweeten the pie, for it threatens to launch a redesigning of open public lands. For in ways that seek to conclude the land wars which have spun out in southeastern Utah, by devising altogether new maps that seem a blueprint aimed to set a prominent example for how public lands are now open to vulnerability than to address local interests. In fact, the entire scheme seems a model for letting folks know who is boss–they have decidedly tabled concerns raised in the local Public Land Initiative, and adopted the pro-business Washington strategy of telling local populations what they really want, or what sort of economic development they want to expose formerly protected lands, and what sense of the commons Washington wants to dismantle. Donald Trump doesn’t seem to have much of a coordinated plan for winning a protracted legal fight in court here, but the case sadly seems more, in Trump’s style to be a slam dunk, whose unsubtle GPS scalpels have helped fragment into the actually monumental public lands with little sense of a historical record, serving interests that are in fact far removed from any local needs or demands. Sadly, it seems doubtful he even needs a long-term strategy to prepare for expanding practices of once unthinkable oil- and gas-leasing by selling off once-protected acreage, and developing the leasing and sales of public lands to extractive industries–a big give-away of a Christmas present to extractive industires, who can operate without much or any public oversight in the legal setting the Trump administration has orchestrate over time with what seems a frightening degree of foresight for an administration that so often turns on a dime. The strategy is particularly dangerous as it seems to set sites on making more open lands in the west–at the same time as they are historically shrinking–vulnerable by what seems federal sale to the highest bidder or the closest friends, and opens the way for the lease sale of public resources, championing local interests and rights that don’t necessarily exist–and certain aren’t legible in the way that Trump and Secretary Zinke stand to map the reduction of public lands in the individual case of Bears Ears–in order to mask a vast giveaway of resources to dirty energy companies under the name of streamlining federal land policies, eroding public protections by undoing rules without any process of public review, starting from the repeal this past August of the Official Natural Resources Revenue rule enacted by the Obama administration that was designed to increase the amount of revenues from any drilling, mining, or extracting of fuels on public lands. Whereas the Royalties rule would split such dividends between states and the feds, preventing companies from selling raw goods to shell companies that could be sold for export tax free, by affiliates or subsidiaries. 10. In rewriting federal land regulations, Trump has privileged the opening of formerly protected lands to leasing in ways that parallels the moves by Trump’s EPA to redefine national waters, dismantle regulations on mining and drilling for oil, and indeed for opening public lands to speculation by extractive industries without any recognition of the dangers methane emissions and carbon pollution pose to global warming or man-made climate change. By reducing government revenues and expanding profits for extractive industries and waving rules to limit methane emissions from oil and gas wells, drilling on public lands can now be far more profitable, after the Trump’s executive orders lifted of any consideration of the social cost of carbon that would take into account whether coal mines and surface mining would generate “costs” by greenhouse gas emissions. The undoing of these federal regulations was rarely accompanied by concrete illustrations, but are now made more evident in the opening of Bears Ears and the Escalante. They respond to the lifting of a three-year moratorium on new coal leases on federal lands while they are reviewed, which long hampered extractive industires, which produces about 40 percent of the coal used to generate electricity, which Zinke’s cancelled, and a broader review of the Clean Power Plan. Indeed, the local of Bears Ears might be best seen in relation to the global, and to the expansion of extractive energy plans that will work to emit more carbon, and release more methane, than recently issued federal regulations have been primarily deigned to curb. –or the contracted Grand Staircase-Escalante, designated as national monument by President Bill Clinton now proposed to be reduced by about half, shrinking its expanse to a diminished “core” by a logic similarly opaque as a strategy of land management. The cutting of both monuments to an even greater degree than had been announced or intimated suggests a rewriting of federal authority as a dispenser of rights to public lands, in a sort of imagined Droit du seigneur, misreading the legal constitution of Presidential authority as lying in the issuing of executive orders, suggesting that the President is somehow the utmost real estate magnate in the nation, and able to have his administration act like one, if not as a feudal lord: the assumption is that the President is able to act outside of legal authority–similarly to the suggestion that a President is incapable of obstructing justice, because he embodies it, and whatever his word stands as or wherever his signature is amended, executive privilege shapes the law of the land. The terrifying scale of the reductions of public lands that were mapped quite carefully in these leaked maps from the Trump administration suggest the unprecedented scale of landscape modification at stake, and make one think of the scale of the loss ofonce open lands across the west over the previous fifteen or more years. The maps show the extent to which huge expanses were removed from Bears Ears under the rhetoric of “liberation,” but concealing what real interests were at work in their redefinition. The suggestion of such a liberation from constraining regulations indeed suggests how much the remapping provided a basis for reducing the monument in ways that stand to reduce and irreparably diminish its monumental status. 11. Contemplating the scale of such a change in a former commons is where we must begin. For the deeply ethical question of continuing to fragment public lands of such importance raises deep ethical questions that are handily obscured by the GPS scalpel used in UTM projections of the former national monuments. The expansive context of the intensive modification of western lands pose part of the problem, and they might suggests the category confusion that has occurred between the administration of a public good and projects of historic preservation and the extreme fluidity of the real estate market. It is tempting to compare the encroachment on open space, if not public lands, in comparison to the downsizing of National Monuments that we may yet see, as the leasing and losing of public lands is in danger of displacing the project of preservation. One cannot but think of the unprecedented contraction of the two national monuments by analogy to the loss of open space across so much of the American West–even as that space has rapidly disappeared. The sudden contraction of open spaces is striking even if one limits oneself to the decade 2001-11–but registering landscape modification by the astounding pace of extra-urban growth, before much of the spread extractive industries. The booming real estate market has rewritten the landscape, although the absence of the modification of open lands stands out in southeastern Utah. This reflects the presence of the monument and success of long-term preservation of sensitive areas for development–but reveals the increased interest of extractive industries to gain access to them as well, and prepares for the potential of the future modification of Nevada’s Gold Butte, which seems next on Zinke’s laundry list for the conversion of federally administered public lands to private industry, in a misguided attempt to reward extractive industries in the belief of the benefits of jump starting the domestic energy industry. Rather than modification by housing, the opening of the public lands of a former national monument to private interests is designed primarily for mining and drilling. What gives with the bizarre restriction of the Bears Ears region is in danger of being a dramatically shrunken national monument? Energy needs is a large part. Even if there were thirty-three others that Obama named, this one is special, and not only for the wealth of energy in the ground, but the precedent it sets in revising the protection of federal lands. This is in part because Bears Ears was of course covered under the Antiquities Act, and because it suggests a relation to the past that doesn’t seem to have ever been particularly prized by a President fond of invoking a Disney-fied Pocahontas before Navajo elders. Even if Donald Trump’s official modification did not strip the region of monumental status, the isolated hatched regions seem cut out of the existing boundaries, including the Valley of Gods, which while it remains an Area of Critical Environmental Concern, may soon find itself open to a number of extractive technologies without any regulations, if Interior Secretary Ryan Zinke has his way with ending that land-use designation. For Zinke has long hoped to open federal lands for mining–and may be the one at work in so dramatically redrawing the protection of federal lands. The decision leaves many of the areas that are under consideration as future Areas of Critical Environmental Concern in a status that is also unprotected, or in other words open for prospecting. While Congress would need to vote on including or not including such potential Areas of Critical Environmental Concern, shouldn’t Congress to consider who benefits from opening up these lands for mining and rather than for protection as part of a cultural legacy or a practice of remembering, deemed worthy of protection among existing federal lands–it is a double diminishing, in other words, of the notion of a cultural legacy, and of the importance of remembering. The proclamation, while perhaps not legal, seems the opening salvo of Trump’s processing of Zinke’s broader recommendation to trim four entire national monuments on Western lands in order to open them up to actions of ecological destruction and shrinkage of open space–by encouraging permits of logging and mining to future development, which is bound to be a major give away, and bring quite a few eager for expanding coal mining an easy buck. Bears Ears and the Grand Staircase-Escalante, are two of the four sites that also include Nevada’s Gold Butte and Oregon’s Cascade-Siskayou, the former 300,000 acres of desert lands with considerable rock art and sandstone towers and the latter 113,000 acres along the convergence of three mountain ranges, but the Bears’ Ears takes a bee out of The Donald’s bonnet; he was long critical of what he, the quasi-elected arbiter of legality, speaking now as a real estate man, characterized as a “massive federal land grab” that “we’re going to free up”–and in choosing the Bears Ears went for the biggest prize first, and no doubt the most satisfactory as an opportunity to characterize his predecessor’s venality in being in thrall to interests that departed from the local ones he championed. No big fan of natural beauty, anyway, Trump’s eagerness to engineer a huge review of public land preservation in the United States–as allegedly “harming” bucolic American activities that Zinke characterized as “traditional” –“traditional uses of the land such as grazing, timber production, mining, fishing, hunting, recreation and other cultural uses are unnecessarily restricted“–to prevent elitist impulses from harming local economies. The new affirmations from Hatch suggest something like a sharp change of mind, but adopts the similar Reagan-esque rhetoric once again in fashion among Trump’s White House team. “I have a rough time wanting to spend billions and billions and trillions of dollars to help people who won’t help themselves – won’t lift a finger – and expect the federal government to do everything,” Hatch reasoned, after having voted to approve the new Tax Bill to give a real tax break to the owners of private jet planes, even though he had once helped to frame it, with the late Edward Kennedy, who was proud to have convinced him to support it, and which Hillary Clinton also supported as Senator–and has since championed. Is the destruction of the program a knife into Hillary Clinton, or will the sale of public lands help to provide funds for it? At any rate, the “moral responsibility to help children” he once vaunted proudly seems to have disappeared; opening lands for mining, logging, and grazing is the outdated order of the day. For the proud declaration of definitively shrinking a monument that was the size of the state of Delaware–13 million acres–into something the size of Dallas is less the triumph of local interests that Trump seems to have celebrated–but brazen remapping of the landscape of protected lands to a vestige of the region that recently protected, and whose protection was just theatrically rolled back. One might not look for that cunning a strategy in all this, but a classical case of governmental over-reach–in the name of protecting local interests, and rehearsing an increasingly tired opposition between rural America and coastal elites that Trump seems particularly interested in replaying as he visits the regions of America he seems most likely to recognize as trophies on his prized electoral map more than places, and has, of course, spent little or no time. The signing celebration in the halls of Salt Lake City, bizarrely staged under a painting of Western exploration–Lewis & Clark with a passive Sacagawea? While that seems right to marginalize the claims of the native tribes, the lunette actually shows Mormons’ covered carriage as they arrived in the Great Salt Lake Valley in 1847, in an image of manifest destiny. The theme of the painting fits the announcement of demonumentalization, removed from the real site of the park even as protestors outside the Capitol Building beseeched the President to visit the areas he had just demoted as protected public lands. Below the image of the 1847 arrival of Mormons in the Great Salt Lake Valley, “The Passing of the Wagons,” which faces an image of the desert turned fertile by irrigation, Trump seemed to proclaim the land now open for drilling and leasing, as if an auctioneer asking for the highest bid, but invoking that the sale as Manifest Destiny. For in evoking the hoary myth of Manifest Destiny and the interests it concealed, the Executive Order opens lands to public prospecting, mining and speculation presumes a self-serving ideal of unfettered ownership of lands, erasing their relation to native inhabitants and to their historical occupation. The image of the opening of lands stands in odd contrast to the massive contraction of the monument, if it stages a similar conceit of the destined opening of public lands to the settlers of the Great Salt Lake. Yet, rather than offer lands to new settlers, as the mythic story goes, Trump seems to be inviting the wagons of industry into not only southeastern Utah, declaring the opening of vast expanses of once public lands to private interests, with only the promise of trickle-down benefits to states. Indeed, the territorial break-up Trump has decreed by GPS magic follows no logic other than opening up resources beneath the ground, destined to disrupt the coherence of the lands themselves. The proposal offers a dangerous emblem of the dismantling of a logic of protection, conservation, or protecting natural resources. For more than any other president, Trump channeled Ronald Reagan’s disturbing legacy of dismantling the role of representative government, when he taunted on national television that “Some people think that the natural resources of Utah should be controlled by very distant bureaucrats located in Washington.” As Reagan, Trump seems to be using the power of a sound bit to push under the rug that local indigenous groups had long pushed hard and strong for the region’s preservation, and that it has been long been sacred to the Navajo, Ute, Ute Mountain, and Zuni, who turned to President Obama after finding that they had no truck with local lawmakers who were elected to represent them. As Reagan, his failure to appreciate the ecological integrity of lands and the dangers of environmental risks to the nation’s security seems to invite the upsetting of a fragile if longstanding ecological balance The radical reduction appears a trial balloon for the assertion of Washington to give away once-protected lands, as part of a great real estate sell-off, perhaps to try to address the exploding debt, but perhaps more to keep Hatch as an ally in the Senate, securing the commitment from the 83 year old seven-term Utah senator to be bolstered in the state and to exclude the hopes of an increasingly marginalized Mitt Romney who once hoped to contest his seat, cementing the new status in which Trump, who works everything based on personalities and alliances, rather than issues or ideology, to keep a strong ally to pursue his project of selling off of public lands in hopes to Make American Great Again–and to show Romney the back door, again, and let him know who is running the country, or claims to be, by denying the very concept of a public interest. Trump’s predesignation of the monuments seems a desperate power play, and a distraction from ongoing investigations of his immersion in schemes of financial corruption. They are also something of a Christmas present to benefactors, an item to be ticked off that was promised to the special interests not only of lobbyists but within the Republican party. Such rewriting the process of monument preservation and federal lands protection pose deep challenges to the preservation of lands. Hopi, Navajo, Ute, Ute Mountain Ute, and Zuni Tribal Governments are working together to defend Bears Ears National Monument. You can #StandWithBearsEars at protectbearsears.org/action. Daniel, you should send this to the New York Times Opinion editors.